Killing time a few years ago, whilst idly wandering about the city of Madrid, somewhat unexpectedly, I suddenly found myself feeling a certain sympathy for the Devil. Madrid is the perfect city for meandering around on foot. It is one of Europe’s foremost centres of the arts and culture, filled with literary and historical associations, a perfect place for contemplation. The labyrinthine paths of El Retiro lend themselves to just such a sense of natural reflection. On the several occasions I have previously visited Madrid the Retiro is somewhere I always go. El Retiro, or to give it its full title – Parque del Buen Retiro, the ‘Park of Pleasant Retreat’ – is the largest green space within the Spanish Capital. It dates back to the 1500s, and has a long historical association with the Spanish Royal Household, but was first opened to the public in 1767 and finally passed into public ownership in 1868. It is filled with beautiful tall trees, shrubs and flower gardens, with many fountains, artificial lakes, sculptures, and some interesting architectural features, such as the monumental colonnade of the Monumento a Alfonso XII, and the wonderful Palacio de Cristal, or ‘Crystal Palace’ (said to have been modelled on the much larger one built in London’s Hyde Park for the Great Exhibition of 1851). But for me the most interesting feature of the park is a curious bronze statue, set high upon a stone pedestal above a fountain – the Fuente del Ángel Caído, or the ‘Fountain of the Fallen Angel’. The statue is commonly purported to be the only publicly authorised depiction of Satan or Lucifer anywhere in the world. 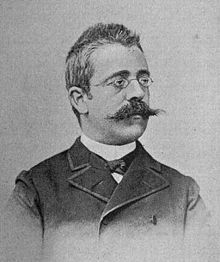 First created in plaster by the sculptor, Ricardo Bellver (pictured right), for the Spanish National Fine Arts Exhibition in 1878, in which it won First Medal, it was subsequently cast in bronze for the 1878 World Fair in Paris. The nearby Museo del Prado later donated the statue to the city, and so it was placed upon a stone plinth surmounting a fountain decorated with various bronze gargoyles each devouring various lizards and serpents, designed by Francisco Jareño. The sculpture of the diabolical winged figure reeling back, with struggling limbs wreathed in serpents, shouting angrily at the sky above, which bears a very strong resemblance to a depiction (c.1866) of the same theme by the artist Gustav Doré, is said to have been inspired by the passage describing Satan’s fall from Heaven in the first Canto of John Milton’s Paradise Lost (first published in 1667, with a final revised version appearing in 1674). 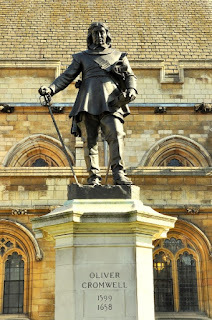 Milton was, of course, a prominent figure in the Puritan Revolution which briefly succeeded in making England a Republic under Oliver Cromwell when the Parliamentarian Forces won the English Civil War in 1651. Milton supported the regicide of King Charles I, and, as such, the sentiments so eloquently expressed in the poem by Satan against the hypocrisy and tyranny of God are often thought to reflect this republican stance – yet, Paradise Lost, by the very nature of its subject, poses a bit of an unfathomable and even somewhat dangerous conjecture; for how can a Puritan Christian using such a metaphor for monarchy not thereby also deny the infallible supremacy of God? 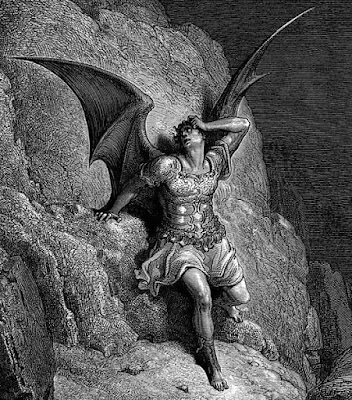 ... It’s a point which literary scholars have debated strongly, alongside the conundrum as to whether or not Satan is, or should be thought of as the central ‘hero’ of the poem. I confess, I certainly don’t know enough about the English Civil War, nor about Milton for that matter, to have a definite view on these contentious questions – but, having read Paradise Lost once, it has significantly hooked my intrigue, and as such it is definitely a work which I know I shall one day return to and read again. Certainly, my first reading of it was fairly beguiling and left me feeling puzzled. I knew Milton was a staunch Puritan and a supporter of republicanism, but reading the lines which speak so clearly against the tyranny of God I couldn’t help but reflect on his political proximity to Oliver Cromwell, England’s Lord Protector, “warts and all”– a different, but nonetheless de facto, kind of dictator. I suspect I may well be reading too much of my own half-informed suppositions back into his poem, but this metaphorical tangle did seem somewhat baffling. 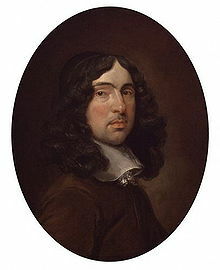 What little I know of Milton is actually gleaned from my readings about Andrew Marvell, the politician who is now best remembered as an exceptionally fine poet. The ‘Metaphysical Poets’, with whom Marvell is now grouped, along with the ‘Romantics’ are my most favourite schools, and I often re-read much of their work; hence why I perhaps feel an affinity for the Romantics’ interpretation of Milton’s epic over those of theologically inclined critics such as C.S. 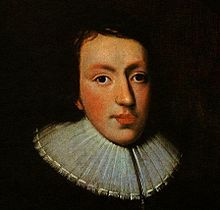 Lewis, who argued that there was no such conceptual conflict and that Milton’s conception of God could easily be disassociated from his views of Charles I (and what of Cromwell? ), whereas William Blake espoused that: “The reason Milton wrote in fetters when he wrote of Angels & God, and at liberty when of Devils & Hell, is because he was a true Poet and of the Devil's party without knowing it.” … It is, as I'd agree, a much more tempting entertainment to let one’s self succumb to a certain Byronic sympathy for the Devil, after all! Both Milton and Marvell survived the Restoration, with Marvell, it is said, succeeding in persuading the government of King Charles II not to execute Milton for his anti-monarchical writings and revolutionary activities. Marvell however remained ‘in opposition’ all his life to the corruption which he saw as rife within the Royal Court, penning anonymous works of eloquent satire upon the theme, the extreme sensitivity of which meant they could not appear in print under his name until well after his death. I’d love to know more about how and why Ricardo Bellver chose Milton’s ‘Fall of Satan’ as his subject for the sculpture in Madrid’s Retiro. There may, of course, be nothing much to it ... But it was, and in many ways, it remains an original subject to depict; and, naturally, certain stories will always arise around such curiosities – for instance, it is said that purely by chance Jareño’s stone pedestal has unwittingly set Bellver’s statue at precisely 666 metres above sea-level. But if such monuments tend somewhat inevitably to accrue a DanBrown-esque tinge of ‘sub-mythification’, it doesn’t take too much over-interpretation to appreciate the curious fact that to this day a statue of Cromwell, that most contentious of English statesmen, still presides over Parliament Square in London, when you know that he is watched over by a craftily concealed ‘head’ of Charles I which is mounted over a sealed doorway of the nearby Church of St Margaret (see here). Even when immortality is perhaps gained in bronze, to be cast out of Heaven is to be an outcast for all eternity.